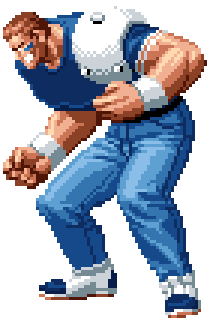 Brian Battler (ブライアン・バトラー) is one of the members of the American Sports Team in The King of Fighters '94. Despite being named MVP of the year, Brian had a violent behavior and only found pleasure in tackling his opponents. He was asked by Heavy D! to fill in the missing spot to the three man team, to which he agreed. In their non-canonical team ending of the King of Fighters '94 tournament, Brian claimed he was going to return to playing football for his fans. A running gag seems to exist with the USA Sports team, where they will receive invitations to that year's KOF tournament, only to be beaten senseless and have their invitations stolen from them by another team. This happened to them in 1995, 1997, and 2000 (with Iori's Team -1995-, the New Faces Team -1997-, and Vanessa, Ramon and Seth -2000- being the respective culprits), and to Lucky Glauber in NeoGeo Battle Coliseum (with Shermie being the assailant). This page was last edited on 18 January 2009, at 16:49.